it was an early early start Saturday morning. we met at Ted's Place at 5:30am and carpooled up to Lake Agnes. we hit the trailhead about 7:30am, suited up and headed up the trail. 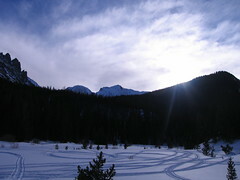 it was a nice snowshoe, about 1 1/2 miles, with the sun rising and glinting through the trees. there aren't any pictures of the training because i was far too busy learning. 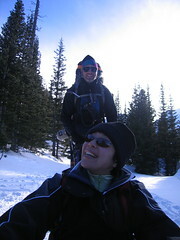 at the end, one of the other snowshoers and i caught a ride down the hill so two of the patrollers could do field certification on 'towing'. it was a lark, mainly because there were several flat to uphill spots. eventually Kim and i took to rowing with our poles. it seemed to help and was incredibly entertaining regardless. overall, i learned a ton from the class and benefitted dramatically from being out of doors. the redness is damage from the taping. it really hurt, but boy did the tape do its job. the swelling was completely gone on Friday but man it is back now. 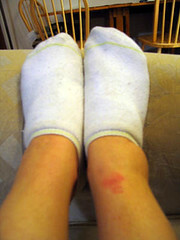 the swelling is severe but the pain isn't too bad. overall, ouch but it was worth it. i got to avail myself of my friend's tub. this thing should be in Architectural Digest. 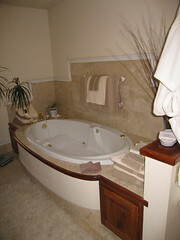 i don't really enjoy baths, but even i will make an exception for a tub like this. skylight, wavy windows, slate tile and jets.